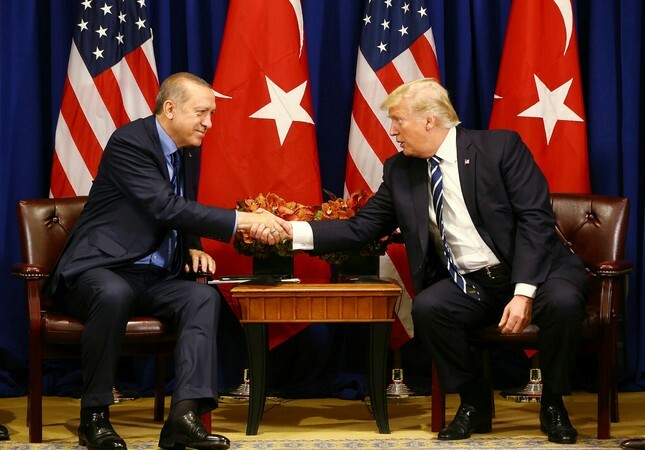 President Recep Tayyip Erdoğan and U.S. counterpart Donald Trump discussed the regional developments in New York as the two leaders praised "the strong bilateral cooperation" between the two countries. Erdoğan said that the meeting, which lasted roughly 50 minutes "was "positive" and the two leaders focused on Turkey's S-400 missile deal with Russia and the Kurdish Regional Government (KRG)'s independence referendum in northern Iraq. The statement released by the Turkish presidency said Erdoğan and Trump reiterated their opposition against the KRG referendum, stating that the move would have serious consequences for the region's stability. Ahead of a meeting, Trump said Turkey and the United States were the "closest as they have ever been." Erdoğan responded to Trump's words, saying that he is a "dear friend." "I would like to thank my dear friend Donald for hosting us here today. We will conduct discussions on our bilateral relations and regional developments," he added. Speaking during a press conference ahead of the meeting, the Republican leader praised the Turkish president for "running a very difficult part of the world" and "getting high marks." "It is a great honor for me to introduce you President Erdoğan of Turkey, he has become a friend of mine," he said. The leaders were also expected to discuss several disagreements, including U.S. support to the PKK terrorist organization's Syria affiliate, the Democratic Union Party (PYD) and its armed wing, the People's Protection Units (YPG), as part of the fight against Daesh, as well as the KRG's proposed referendum on Sept. 25 and the extradition of Gülenist Terror Group (FETÖ) leader Fetullah Gülen, who has been living in the U.S. since 1999. After the completion of his official visit in the U.S., where he attended the U.N. General Assembly in New York, Erdoğan is set to return to Turkey late Thursday.